Get one of the best RTX 2070 card deals, and take the leap into the deep end of super premium graphics. Straight off the bat, the RTX 2070 offers a good balance between cost and high performance return; so much so it has a place near the top of our best graphics cards list. Yup, that pricetag might still seem quite high, but now that the initial excitement and pandemonium has died down since its (and the rest of the 20-series' launch), so have the pricetags and the resulting value has increased. Particularly when there are deals and fluctuating prices going on, this card will offer a serious amount of bang for your buck. While we’re still waiting for more and more games to support the newer developments in graphics—DLSS and ray tracing—what might attract you to the 2070 card is that it will enable you to be ready for when the trickle becomes a flow. The card's third-string Turing GPU will have you primed and in great shape for when it does happen and the games come but also give your rig 8GB GDDR6 with 448GB/s bandwidth. The RTX 2070 basically continues where the GTX 1080 leaves off, with slightly better performance for about the same price (i.e. starting at $500). 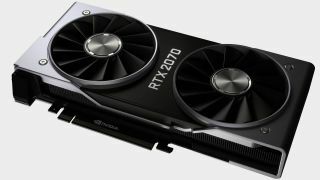 Nvidia's RTX 2070 Founders Edition is the reference point, with a price of $600 and a 1710MHz boost clock. It's a good card but not the best value, as most 2070 cards will typically hit similar maximum overclocks within 50-100MHz. If you're on a smaller budget, options like the EVGA 2070 Black will perform just as well and save you about $100. So, if you think the RTX 2070 is the GPU for you, you've come to the right place as we’ve rounded up the best deals going from the major manufacturers. If you’re after a budget option in the RTX 20-series then check out the best Nvidia RTX 2060 deals, and for the step up from the 2070, check out the best Nvidia RTX 2080 deals to complete your research. One of the biggest names for Nvidia GPUs, EVGA has seven RTX 2070 models of varying names. The XC models deserve the most attention as they strike a good balance between price and features, though we did quite like the EVGA RTX 2070 Black card as you can see in our review. At the top, in terms of factory clocks, is the FTW3 model, which also carries the highest price of $620. Then there are four XC models of varying clockspeeds and prices, which all appear to use the same cooling setup except a few models have RGB lighting. Last are the Black and Gaming cards, both of which have reference clocks and no RGB lighting. The RTX 2070 Gaming is also a blower-style cooler, in case you want to stuff it in a smaller enclosure where the open-air coolers would be more problematic. Asus also has a good collection of RTX 2070 models, going for the lucky seven as well for now. There are three ROG Strix models, ranging from the slightly factory overclocked 8G Gaming (1650MHz) to the full throttle O8G Gaming (1845MHz). The Strix cards all sport a large cooler with three fans and should keep temperatures frosty. A step down from the Strix cards are the Dual models, which drop one fan and shrink the cooler length a bit, but they have a very wide 3-slot design. They're all still factory overclocked (from 1650MHz to 1740MHz on the O8G). The Turbo model fills out the list, with a blower-style cooler and also sporting the same mild factory overclock of 1650MHz. The Dual O8G appears to be the best deal, with prices starting around $510 if your PC can handle a triple-slot card. Gigabyte has seven different 2070 models as well ... but is it a conspiracy or just coincidence? We may never know. Nearly all of them are triple fan designs, with the exception of the 2070 Mini. The Windforce 2070 model might seem like a step up from the baseline, but it's actually sporting reference clocks (1620MHz), but Windforce actually refers to the fan design and is thus part of all the Gigabyte cards. The Gaming model appears to be the same design with slightly altered colors, while the Aorus branded cards carry the highest overclocks (up to 1815MHz on the Aorus Xtreme). All of Gigabyte's cards, with the exception of Mini, also include RGB lighting with RGB Fusion integration that allows customization of the lights. Gigabyte also has a standard 3-year warranty (in the US at least), but the Aorus cards bump that up to four years. Just beware that outside of the Mini (170mm), these are long cards that may not fit in all cases (280mm, 290mm for the Aorus models). Not to be outdone by its competitors, MSI checks in with a full suite of ten RTX 2070 models. (So much for the conspiracy theory.) These range from reference clocked cards like the Aero and Ventus to beefy factory overclocked models like the Duke and Gaming Z. The Gaming Z has the highest boost clock of 1830MHz. In the middle are a slate of Armor models with dual fans, while the Gaming models include RGB lighting. The Aero is also equipped with a blower fan if that's what you're after. Again, the Duke and Gaming Z cards are quite large, so they may not fit some cases. At the other end of the spectrum from MSI sits PNY, with only two 2070 models. They're solid enough performers, but it's really going to come down to pricing more than anything. The blower sports reference clocks but has an MSRP that's the same as the Nvidia Founders Edition. The XLR8 model on the other hand matches the Founders Edition on clocks and has a dual fan cooling setup. We'd give the blower a hard pass, as other blowers cost quite a bit less, but the XLR8 is certainly worth a look, as retail prices start around $500. The PNY models may not be as flashy as the competition (there's no RGB lighting to speak of), but sometimes that's a good thing. Less is more is the motto here. Zotac offers an even half dozen RTX 2070 models, and if you’re chasing the highest factory overclock speeds, the AMP Extreme model takes the cake. It's clocked at 1860MHz boost, which means it's likely running at 2000MHz in most games (give or take). The GDDR6 gets a small bump to 14.4Gbps as well, which is a rarity for factory overclocks. This is also a big old beast with three 90mm fans needed to keep it cool, but it measure 308mm in length and occupies 2.5 slots, so it's certainly not going to fit in any daintier cases. The Amp Extreme Core is the same design, but with a slightly less aggressive 1815MHz boost clock. If you're not after a massive card, Zotac offers two Mini 2070 models that measure just 211mm, and they still include dual fans. One has reference clocks (1620MHz boost), while the other bumps that up to 1650MHz. Not that you couldn't manually overclock any RTX 2070 to get similar results. Rounding out the collection are a blower model along with dual-fan Amp, which is arguably Zotac's best combination of performance (1740MHz), features, and price.